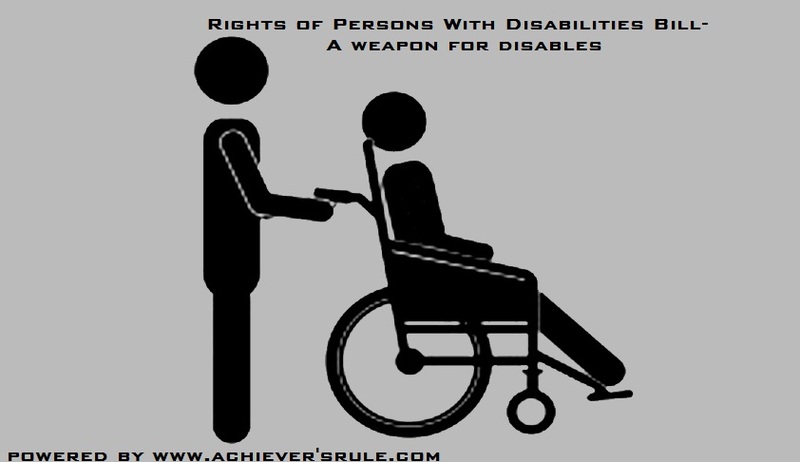 A person's disability should not be the barrier in his/her bright future and they have the rights to achieve it. To help the people with disabilities to make their future, the Government of India has given a helping hand to them in the form of 'Rights of Persons With Disabilities ( RPWD) Bill'. The bill is passed in both of the Lok Sabha and Rajya Sabha by replacing the existing PwD Act, 1995. Disability gets a new definition based on a gradually developed dynamic concept. The types of disabilities mentioned are increased from 7 to 21.Central Government can raise the number if it is necessary. For the first time Speech and Language Disabilities are added to the existing list. As well as, person suffering from Dwarfism, Mascular Destrophy are marked as separate class with disability. Various Blood disorders( Thalassemia, Hemophilia, Sickle Cell Anemia) patients are also marked as disable. Victims of Acid attack can also claim their rights as disable under this new bill. Along with it, the Govt. will have the power to notify more categories mentioning their respective disabilities.The Government official are given responsibilities to implement this bill effectively so that the disable can avail all the benefits like others. Person with various disabilities will enjoy additional benefits from the Government. They must get reservation in higher education, government jobs, poverty alleviation schemes, land allocation etc.People with benchmark disabilities are also marked and they will receive more support from the Govt. The children of age group 6-18 years with benchmark disabilities can have education for free . As well as, special classes must be held in the Govt. funded Institutions to provide inclusive education to them. Central and State Advisory Boards on Disability are formed at central and state level to set up proper policy for the disables. The Chief Commissioner's office for the person with disability will comprise 2 additional commissioners. An advisory committee will be formed by 11 members with knowledge in various disabilities. The state and district level advisory committees will also be there to address local concerns. The rules and regulation of these committees will be prescribed by the State Govt. Separate national and state funds will be created to support these people financially. The Bill also provides strict law against the violation of the bill. Penalties must be charged for any offense committed against the disable persons.Special courts will be formed in each district to handle these type of cases. This bill is made to fulfill the obligations under an international treaty. As disability is a subject of state list, Parliament has certain obligations to impose any rules on the states and municipalities. The estimate for the national and state fund for the disables is not done properly. Violation of this act can charge a fine or imprisonment. But the kind of violations are declared properly. In extraordinary situations, district courts can appoint guardians for mentally ill person. The safeguard against the misuse of power by the guardians is not much satisfactory. The bill is not also consistent with other laws like termination of women employees during pregnancy etc.